Newly-appointed finance minister AHM Mustafa Kamal has asked National Board of Revenue to review the country’s existing income tax rates for corporate and individual taxpayers to make them ‘balanced’ and ‘rationalised’ with a view to boost revenue mobilisation, expand tax net and attract investment.He also instructed the tax authorities to submit recommendations on the issue of budgetary exercise for the next fiscal year 2019-2020………………..
President Md Abdul Hamid has promulgated Bangladesh EPZ Labour Ordinance 2019 bringing establishments of Export Processing Zones within the purview of inspection system of labour ministry.Legislative and Parliamentary Affairs Division of the law ministry on Tuesday issued a gazette notification of Bangladesh EPZ Labour Ordinance 2019 repealing EPZ Workers’ Welfare Association and Industrial Relations Act, 2010………..
Dhaka stocks continued with gains in the past week to extend the bull run to the fifth week as investors kept injecting funds, especially into the financial scrips, while a some others went for profit taking share sales.The daily average turnover on Dhaka Stock Exchange increased further by 7 per cent to Tk 1,054.33 crore in the last week from Tk 985.12 crore in the previous week……….. The motorcycle market is set to be around 6 lakh units by the end of 2019 thanks to price cuts, increasing purchasing capacity and thrust for faster mobility.“2018 was a good year for the sector but 2019 will be better,” said Hafizur Rahman Khan, chairman of Runner Automobiles, a pioneer in the field…………. 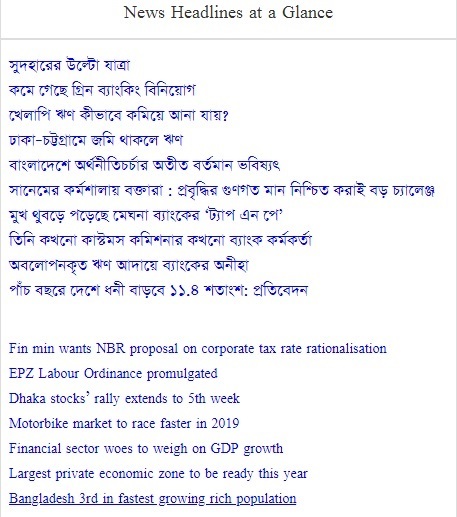 The country’s largest private economic zone, Sirajganj Economic Zone Ltd (SEZL), may open for entrepreneurs within this year.“We expect that we will be able to allot the plots of the zone within December this year or the first half of next year at maximum,” said the zone’s director, Sheikh Monowar Hossain.The zone is expected to create employment opportunities for five lakh people and bring in over $2 billion in investments. Its architectural layout designates space for 400 industries.Hossain said the SEZL spent Tk 350 crore to acquire 1,035.93 acres of land, which was now being readied and levelled with sand………. Bangladesh has the third fastest growing rich population in the world, according to a global report released last week.The number of high net worth population in the Bangladesh is set to increase by 11.4 per cent by 2023, said Wealth-X.Only two other countries will see their rich population grow faster than Bangladesh during this period. The two countries are Nigeria (16.3 per cent) and Egypt (12.5 per cent)…………..